← I want to be Discussion Director this time! If students ran Teacher Training…. During a Literature Circle Discussion, a group of students were discussing the teacher, Mr. Maxwell, in the novel, A Week in the Woods by Andrew Clements. As I was making my way around the room to the different circles going on, I stopped at this group and joined their discussion. We began talking about teachers and how they plan their days. They wanted to know if I could choose to do what ever I wanted in the classroom or was I told what to do by the school? They also wanted to know how I tried to make class more exciting for the students and how I knew if kids were interested in my class. I was so impressed by their questions and really enjoyed the conversation we had! 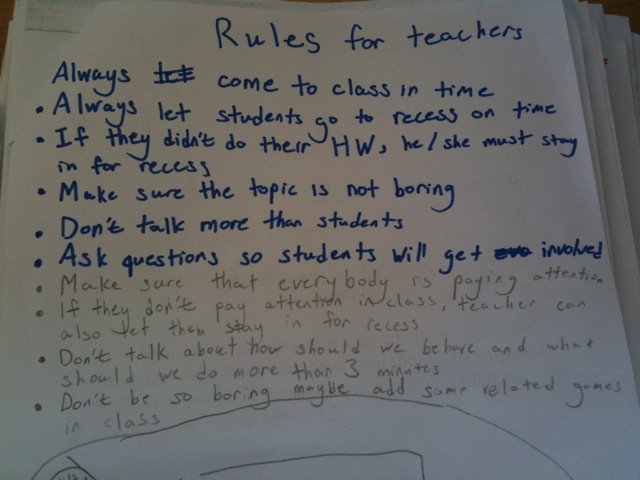 After our discussion, the group of students were inspired to create a list of rules they felt teachers should follow! This is a picture of their draft. As I was reading this after school I began to reflect on what kind of teacher I was in the eyes of my students. Am I talking too much? Do I make an attempt to get everybody involved? Am I respectful and value the time of my students? As a teacher, I believe these are factors we need to consider when we are planning our days and reflecting upon our lessons. Making time to gather feedback from our students should be a part of our professional development. How do you collect feedback from your students? This entry was posted in PD, Reading and tagged feedback, literature circle, reflection, student voice. Bookmark the permalink. 2 Responses to If students ran Teacher Training…. Will the students be interested in the project and not bored with it? Would the kids enjoy this? Is it educational and fun or will my students space out and get bored and not learn anything? Is this a good topic for my kids to learn about? Will they understand it when i teach it? What would the students like the most? Make sure the lesson has something interesting involved in it. I think that probably the responses would be the same worldwide with a difference regarding the HW question. The students in Asia are very focused on HW so the responses reg HW reflect the culture of the kids also. I wonder if western kids would be so focused on staying in at recess if HW wasn’t completed on time!! !